When I found out I was pregnant with you, I immediately knew I wanted to have a natural, unmedicated birth with midwives here in Calgary. 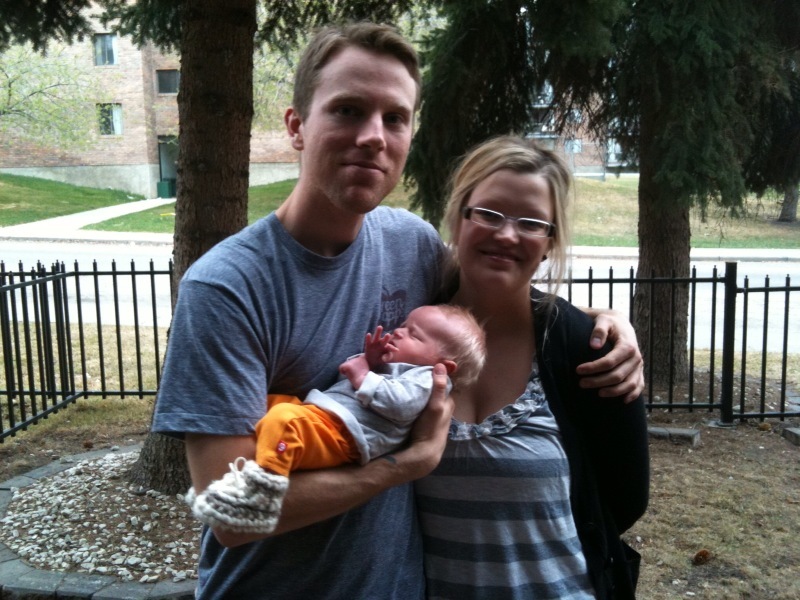 The Previous year, the province of Alberta started covering midwifery care under the provincial health care plan (previous to this, the cost was upwards of $3000 to have a birth under the care of midwives) and because of this, the few number of midwives in the city were very quickly booked up. 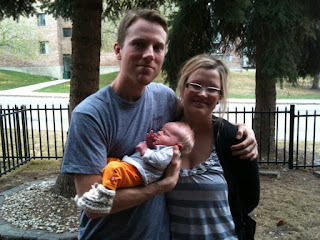 The day we found out we were pregnant, the first think I did was contact all the midwives in Calgary and request to continue my pregnancy under their care. At the time, there were four midwifery practices in the city, and all were completely booked solid. They did however put me on their wait lists in case anything came up. I also went as far as to contact midwives in Cochrane and Canmore- also being added to their wait lists. Every week I would call or email to see if any spaces had opened up and to make sure I remained fresh in their minds should anything become available. Around the six month mark, I got a phone call from the Briar Hill Midwives saying they had an opening for us on one of their teams! This changed everything! We were ecstatic and beyond joyful to meet our wonderful midwives: Shannon, Luba, Aisia and Savanna! 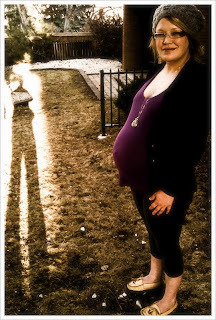 We had talked about home birth, but being that we live in a rather small condo, I was nervous about that idea. We eventually settled on the plan of using the Arbour birth centre- a homelike setting set up with large birthing tubs, and a lot of the amenities of a hospital. During our first visit to the midwives, Shannon took my blood pressure and noted it was a little higher than what was considered normal. We chopped it up to nerves! I had been looking forward to this day for months and was so anxious to begin care with them. The following few visits, my blood pressure continued to read on the higher end of things, and they began to become concerned. They had me monitoring my blood pressure through out the day, and I had to let them know of any higher readings. We also put a major focus on relaxing, not feeling stressed out and taking time off of work when we needed a break. We went for a lot of prenatal massages, and met a wonderful acupuncturist named Dr. Katie who gave us many treatments to try and lower my blood pressure and calm me down. Finally, towards the begining of March, Luba took my blood pressure and it was VERY high! She immediately sent me to the hospital to meet Savanna and run some tests. We ended up being there ALL day. They monitored your heartbeat, took my blood pressure every 15 minutes, and did some blood work. Everything was normal and you were still happy and healthy! They consulted with a doctor at the hospital, and she advised that I start taking some medication to lower my blood pressure. I was really uneasy and upset about the idea of taking drugs with you in my belly, but the other option was to induce me and deliver you right there and then, and I thought you would be better off staying in there to grow a little longer. I was told I would not be able to work anymore and was ordered to stay on bed rest for the next month until you were born. Bed rest was REALLY boring! I wanted to get out and do things, clean the house, set up your room and shop for the final things you would need, but I also knew I needed to relax and keep my blood pressure down to make sure we were both safe and healthy. I cheated a little bit and would walk over to the mall once and a while. I figured some fresh air and a little exercise would be good for us both. I remember once about a week before you were born, I walked over to the mall to get a few things I needed for your upcoming birth, and I got to the furthest end of the mall and was suddenly exhausted! My feet were so swollen and I didn’t think I was going to be able to walk all the way back across the mall and then home again! I stopped at the book store and had a lemonade and rested for a little bit and it was just what I needed to give me a burst of energy to make it back home. Needless to say, after that I made our walks a little bit shorter. Every week I had to go to the hospital and have tests run to make sure things were still normal and you were ok. Each week they gave me an ultrasound to ensure you were still growing and that my high blood pressure wasn’t affecting you at all. Again, I was really uneasy about so many ultrasounds and so much monitoring, but I felt like it was a safer alternative than being induced and delivering you before you were ready. Around the first week in April, they started talking about planning my induction. The only way to cure my high blood pressure was to deliver you, and so even though things were still looking fine, they were worried that something could happen quite suddenly, and they didn’t think it was worth the risk. 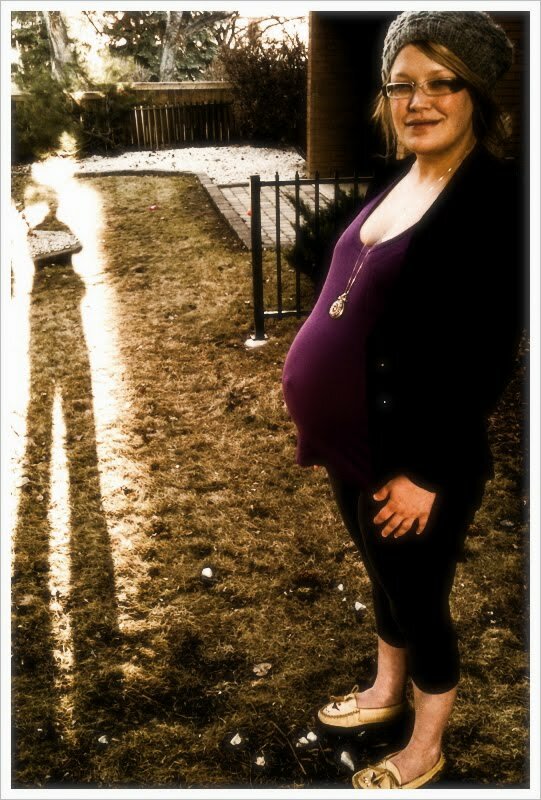 They decided that when I got to 39 weeks, they would induce me- about one week before your due date. Because of the induction, and the risk of my high blood pressure, we were told we would have to deliver at the hospital, and we were not able to move forward with our birth as planned at the birth centre. I was really sad about this, but was reassured that regardless of the location, we could still have a wonderful natural birth like we wanted. The days before they were going to induce me, I tried everything I could to try and start labour naturally. We went for acupuncture with Dr. Katie several times. She also showed us some pressure points to use that were known to stimulate the uterus and start contractions. We went and had some special adjustments with our chiropractor, Dr. Jeff (he would later give you your first chiropractic adjustment when you were just 1.5 weeks old!) and we had a wonderful massage with our friend David. 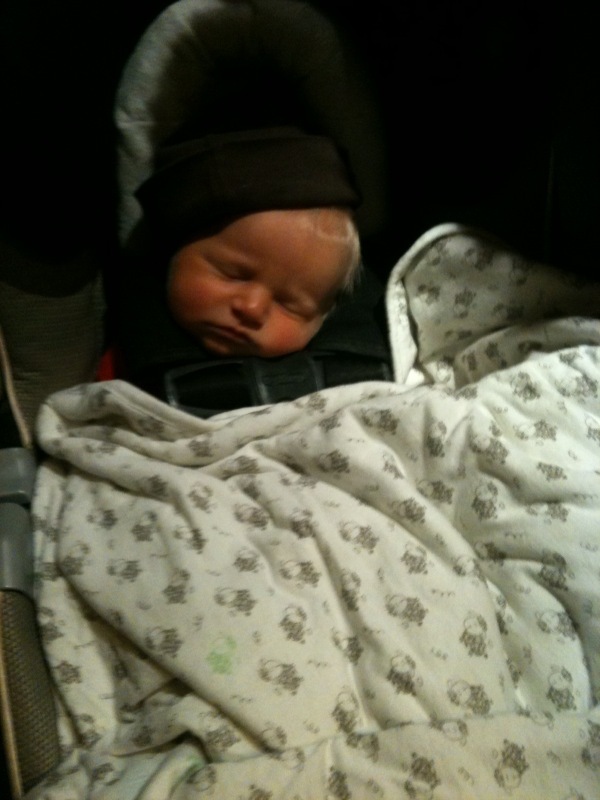 The night before the induction, I felt some cramping and a few mild contractions. You were definitely moving, but labour did not start. Bright and early on the morning of Thursday April 8th, we packed up and drove to the Foothills hospital to once again meet Savanna. We were excited, nervous, and a little scared of what was to come. The hospital was VERY busy that morning. We waited a while before we got a bed in triage, and they weren’t sure if they would actually start the induction as there were no available rooms for us. Savanna checked my cervix and I was 2cm dilated, but not effaced. Finally, at around 11:00am they decided to get things under way and I was given a dose of Cervadil, an internal drug to help ripen my cervix and start the induction process. We spent the rest of the day waiting for something to happen- eating yucky hospital food, going for walks in circles around the hospital hallways and talking about how excited we were getting to finally meet you. At around 4:30pm, we were walking the hallways and I started to have some contractions. They weren’t very strong or long, but it was a start and I was excited! We walked A LOT to try and keep the contractions going. That afternoon a big snow storm started- we had had beautiful weather up until that point, but I remember having one contraction and looking out the window to see this gray snowy blizzard. I was happy to be warm inside and spending my last few hours with you in my tummy. At 11:00pm, the nurse told us that your Dad would have to leave for the night. That we both needed our rest and it was better for him to go home and sleep well and for me to try and rest- they said they would call him if I went in to labour. I was really sad about this, but knew it was best for us to both get some rest. Your dad said it was strange being in the house alone. Chapeau (our dog) was staying at your Auntie Stephanie’s house, so your dad had the whole bed to himself. It seemed as though as soon as your Dad left, the contractions got much harder and were consistently coming every 30 seconds. I wasn’t feeling very well and the lady beside me was eating fried chicken. The smell was disgusting! I spent most of the night in the bathroom as to try not to wake the lady beside me, and to get up off my back. I was thankful that the bathroom had a cold air vent at the perfect height to blow cool air into my face as I rocked back and forth to try and ease the pain. Around 3am, I was getting cold sweats and was feeling really sick. The midwives had left so I was under the care of the hospital nurses. I called the nurse to make sure everything was normal. She said everything I was experiencing was a result of the Cervidil, and offered me Tylenol and Gravol to take the edge off and hopefully let me get some rest for when real labour started. I agreed and was grateful to be able to get a few hours of sleep. In the morning, your Dad came back up to the hospital around 7:30am and my contractions had completely stopped. I ate breakfast and waited for Savanna to come back and check on us. She stopped by around 9 am, checked to see how we were doing, and said I had only dilated to 3 cm. I was a little sad as I had had a rather rough night of contractions, and thought I might be further along, but was still excited that soon we would get to meet you. She gave me a second dose of Cervidil and again left us, saying to page when the contractions got really long and close together. Grandma Lenover came up to visit around lunch time. She brought sandwiches and cookies and when she arrived, papa decided to jet out to the bookstore to grab a book as he figured we would have another day of sitting around the hospital waiting for things to get going. I was about to take a bite of my sandwich, when I suddenly got the strongest contraction yet. It took my breath away! After that, they started coming fast and furious. They were so strong and very painful! By 2:00pm, the contractions were 15 seconds apart, lasting over a minute and were VERY intense. Your Dad showed up right as they were starting to really get painful and I told him to call the midwives right away. A nurse came by to check on us and shortly after, Savanna arrived. She checked us out and we were quickly transferred to a labour and delivery room. I remember she asked if I thought I could walk, and I knew i couldn't. 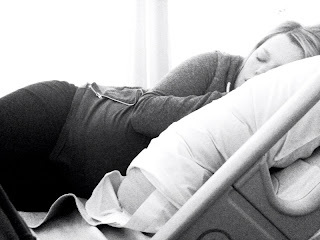 I dont remember much about the wheelchair ride from our room to labour and delivery, but I can still feel every bump we hit and trying to sit still while the contractions kept flooding over me. It was the longest wheelchair ride of my life! Once in the delivery room, Savanna got me in the shower. The hot water felt nice as it pounded against my back. We brought in a birthing ball and I sat on the ball and let the water run over me. I remember bouncing just a little bit on the ball and feeling my water break. Shortly after I wanted to get out of the shower. We moved to the bed and I tried to breath and focus through some of the intense contractions. I could feel your head very heavy and low in my pelvis- right against my pubic bone, and moving from position to position or walking around was very painful. I felt like I needed to go to the bathroom, but remember saying I was worried I would start pushing- I was feeling the urge. Savanna drew me a bath and helped me to get in it. Once in the tub, I relaxed and closed my eyes. It was a lot easier to relax in and breath through the contractions in the hot water. Savanna said if I felt the urge to push, I should go with it. She offered to check my dilation if I wanted just to be sure I was fully dilated, and I was happy to let her. She held back a lip of my cervix for the first push and we were ready to go. I had dilated from 3cm to pushing in 2 hours. It was good being in the tub- the room was dark and quiet and when I think back to that part of the labour, it was definitely the least painful and most relaxing. 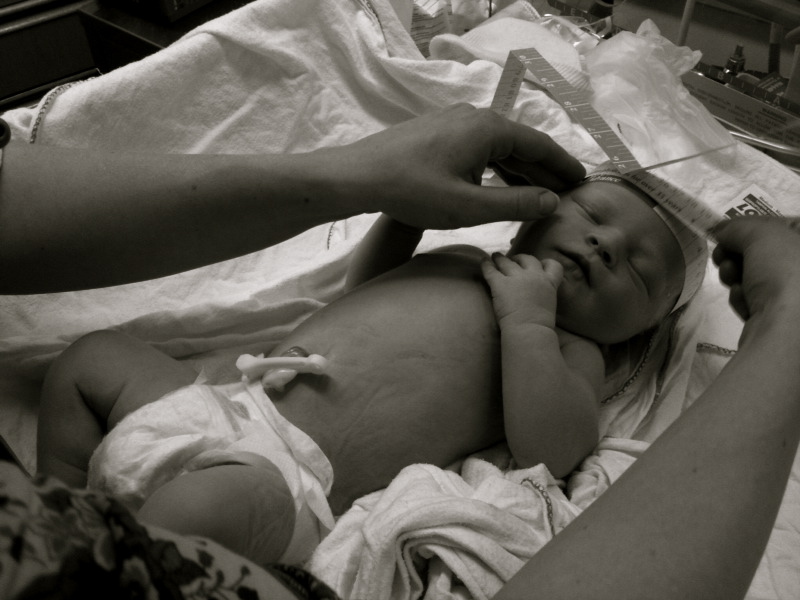 At some point, Aisia, our second midwife arrived and I moved from the tub back to the bed. We tried a ton of different positions all of which felt uncomfortable. Moving from position to position was difficult, as you had now dropped down even lower. Finally after 2 hours of pushing you were out!! 8:25pm on April 9th, 2010! Apparently papa said to me “it’s a boy” but I have no recollection of that. I also had no idea that the midwives gave me an injection in my leg of oxytocin to ensure that excessive bleeding didn’t happen. I agreed to this before hand, but didn’t even see or feel it happening- I must have still been in a daze. I remember I looked up and said quietly to myself “it’s a boy!”. As soon as they laid you on my chest, all the pain just dissolved. 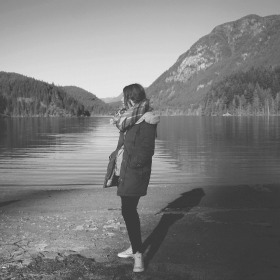 I couldn’t even recall any of the struggle I had just gone through- it was the neatest feeling. Grandma Lenover was off to the side, and I remember calling to her to come see. I held you against my chest and just stared at you for what felt like hours. You had SO much white hair and your little eyes were so blue. Your skin was perfect. You were perfect! I snuggled you and tried to get you to breastfeed. You quickly got the hang of it and started sucking away. It was such an amazing moment. The room quickly quieted down and we cuddled as a family for a while. The midwives filled out paper work and we just sat in awe and utter delight. Eventually, Savanna took you and Papa aside to do a few little tests- she had Papa change your diaper and dress you. Aisia helped me to the bathroom, gave me lots of juice and helped me get dressed. We didn’t know what we were going to name you, so we just called you ‘Panda’ for the first little while. The midwives asked if we wanted to go home, or stay the night in the hospital. I was so eager to go home, and couldn’t fathom spending another night in the hospital alone while Papa tried to sleep at home without us, so we quickly jumped at the opportunity to go home. Three hours after your entry into the world, and we were in the car listening to Bob Dylan on the way to Grandma and Grandpa Lenovers house! We spent the first few days with them so that we could all get some rest and Grandma could help with little things we weren’t sure about yet. It was so nice to have your family around you. It was nice that a lot of things from our birth wish list came to fruition. I was SO very happy we were able to avoid oxytocin and other drugs and have a birth without pain medication. It wasn’t exactly what we were hoping for, and looking back, there were a lot of things I wasn’t truly happy about, but I honestly think that considering the alternatives and where things could have ended up going, that it went pretty well- And we had you! A perfect, healthy, happy little man! What more could we ask for!? Jess, you made me cry! I can remember us all sitting in Rhonda's basement with our big bellies like it was yesterday. Now they're all turning 2, and their siblings are starting to pop up (or out, I should say) and it's blowing my mind!!! i know - it totally feels like just yesterday! and suddenly, we have children, not babies! well, i guess technically you have a child and a baby! :) we think of you guys often and wish you were closer, but look forward to reconnecting in the future when all our little muchkins can play while us mamas gab and sip coffee- like the good ol' days.